New Kitchen Cabinets: What's Your Own Style? In a full kitchen renovation project, new kitchen cabinets represent the single biggest investment you will make. So, you want to get this purchase right. When you are considering your purchase of new kitchen cabinets, my recommendation is to start at the highest level and work down to the details. Highest level, in this case, would be the general kitchen or even house style that we will list directly below. Details would mean things like choosing kitchen cabinet hardware. You may later regret the decision when you have more time to reflect on it. By then, those kitchen cabinets are firmly planted in place. Subsequent buyers of your house may balk at clashing kitchen-cabinet-house styles. Your new kitchen cabinets' finish color is the first thing that will stand out in your remodeled kitchen. At first glance, an all-white thermofoil kitchen feels markedly different from cabinets with a very dark espresso color. It is important to note that finish color and wood selection are sometimes (and erroneously) used interchangeably. For example, "cherry" is sometimes used to describe the color of a certain type of kitchen cabinet. Cherry is actually the type of wood, and we will discuss this later. To confuse matters more, wood stains take on different colors when applied to different types of woods. So, it's necessary to look at wood types and stains in conjunction with each other, similar to the Keidel Cabinet Wood Finish chart above (see link below for the Keidel site). Unfortunately, it is pointless to offer new kitchen cabinet finish colors because, like paint colors, these are subject to the whim and creativity of the manufacturers. Calling a finish color "Toffee" or "Autumn Blush" gives only the faintest impression of the color itself; it's more of a marketing device. Here's the great news about choosing the materials for your new kitchen cabinets: it's not necessary to spend a lot of money on fine hardwoods. The cabinet stain can carry the ball. For instance, even ordinary oak cabinets can be stained to a dark, rich mahogany wood-like appearance. As noted earlier, colors behave differently with different kind of woods--but you can leave that in the hands of your cabinet manufacturer. An espresso finish on maple looks much like an espresso finish on birch. However, as you progress to lighter cabinet stains, the selection of wood is crucial. A strongly patterned wood like hickory is much different from the creamier maple in these lighter finishes. So, this is where wood selection comes into play. It's fair to note that even in the dark finishes, the characteristic streaks and burls of hickory will show through to some extent. 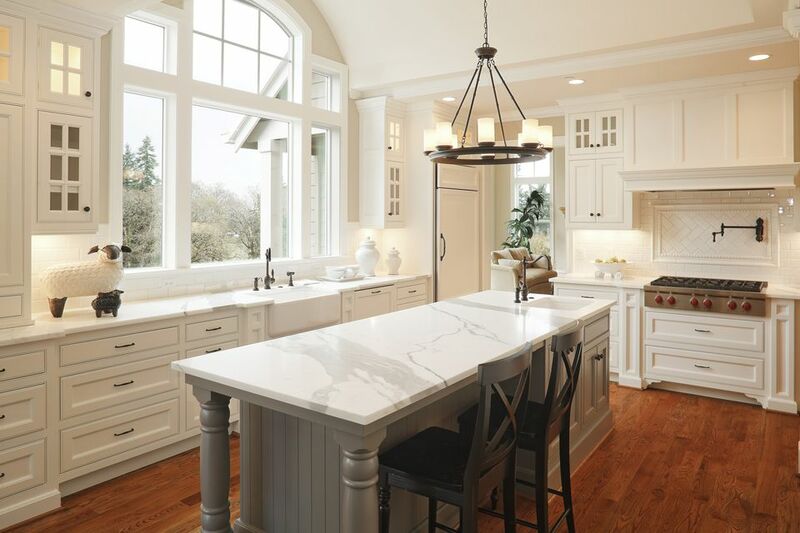 Armstrong Cabinets has an excellent comparison of the different types of woods available for new kitchen cabinets (link referenced below). Oak - a reddish wood with an open grain. Cherry - a multi-colored hardwood with many specks and curls and gum pockets. Maple - a uniform, softly highlighted wood. Hickory - the most eye-popping wood in its natural state, hickory is a cacophony of dark streaks and dots. Birch - a hardwood with strong vertical stripes. MDF (Medium Density Fiberboard) - engineered wood unsuitable for kitchen cabinets in its natural state, MDF is always covered with some type of veneer such as thermofoil. Finish treatment for new kitchen cabinets? What is that? Homeowners shopping for new kitchen cabinets first wrap their mind around wood species selection and finish color--then they get hit with this question. It's easy to pass off cabinet finish treatment as a minor detail, but it's far more than that. Let's take a look. Cabinet finish treatment refers to the appearance of the finish, excluding color. You might have a transparent natural treatment that lets the beauty of the wood grain show through. Or you might want a treatment on the other end of the spectrum--a painted finish that completely blocks the wood grain. Then, of course, you have an entire range of finish treatments between those extremes. Thermofoil - The veneer, usually white, that covers the entire surface. Paint - A thick coating of paint that is more about the color of the paint than the texture or color of the wood grain below. Distressed or Vintage Paint - Basically, the paint finishes above but either hand- or machine-distressed to create an attractive, aged appearance. Glazed - After the base coat of stain, a glossy layer of glaze is applied for a more contemporary look. Highlighted - Your basic stain but with darker highlight colors added to recesses, giving the cabinets more of a 3-D appearance. When considering new kitchen cabinets, you'll need to look at two aspects with regard to door style: overlay and the actual door style itself. These work in conjunction with each other. What Does Cabinet Overlay Matter? Full Overlay - This is "all door," no cabinet frame showing. It's a sleek, contemporary look. Partial Overlay - Partial cabinet overlay exposes some of the cabinet frame. These can be 1/2 inch, 1 inch, or greater. These contribute to a classical look and gives the cabinets a deeper, more visually textured appearance. Arches, squares, and cathedrals: cabinet door styles are fun to choose. This is not an exclusive list. Crownpoint Cabinetry has an excellent page illustrating various door styles (linked below). Even though kitchen cabinet glass doors technically falls in the category of door styles, I have separated them because they are so distinctive. Glass kitchen cabinet doors give your kitchen a more "open" feeling. Since kitchen cabinets tend to feel imposing, adding in some glass-front cabinets will give your kitchen greater dimensionality. Not only that, you can add interior lighting to cabinets with glass-fronted doors for a mesmerizing effect. Glass-front kitchen cabinets can help you highlight special china or other attractive items. Crownpoint Cabinetry has an excellent page illustrating various door styles, including glass cabinet doors. See the link below.